If you had eyes in the back of your head you'd see all the admiring glances coming your way each time you wear this blouse. It features a v-shaped back yoke and graceful pleating that gives movement to the luxurious hammered satin. 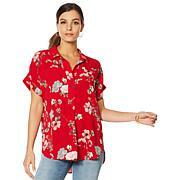 Beautiful blouses make it easy to look pretty in minutes. Whether dressed in your favorite jeans or tailored pants, top them with this lace-trimmed blouse for an outfit you'll feel fabulous wearing.